We want to give extra recognition to the Great Grins KIDS who are doing a stellar job in taking care of their teeth and remaining cavity free! 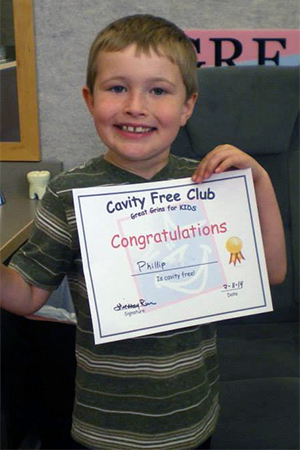 If your child has a cavity-free check up, they will become a member of the Cavity Free Club! We will give them a certificate and enter their name in a drawing for some extra special prizes. At the end of each month we hold a drawing. The winner of the drawing will not only get a special prize, but their picture will be featured on our Facebook in our Cavity Free Album! If your child has a cavity at your visit - don't worry! Once Dr. Fariba Mutschler or Dr. Mark Mutschler has taken care of them, they will be once again Cavity Free and eligible for the Cavity Free Club!